Maximum Posts: You can set the maximum number of posts allowed to be selected. Leave this field blank or set to -1 for infinite selections. The API will return an array of post objects in the same way that the get_posts function would. This example shows how to load the selected posts from a relationship field and display them in a list. This example does not use the above mentioned setup_postdata function, instead, the $post->ID is passed to the functions to target the selected post. Please note that some of the function names change to allow for the $post_id parameter such as the_title() => get_the_title(). It is possible to load only the selected post ID’s, instead of the post objects. This way, you can use the ID’s within a WP_Query and specify arguments such as posts_per_page, order and orderby. To learn more about the WP_Query arguments, please read http://codex.wordpress.org/Class_Reference/WP_Query#Parameters. 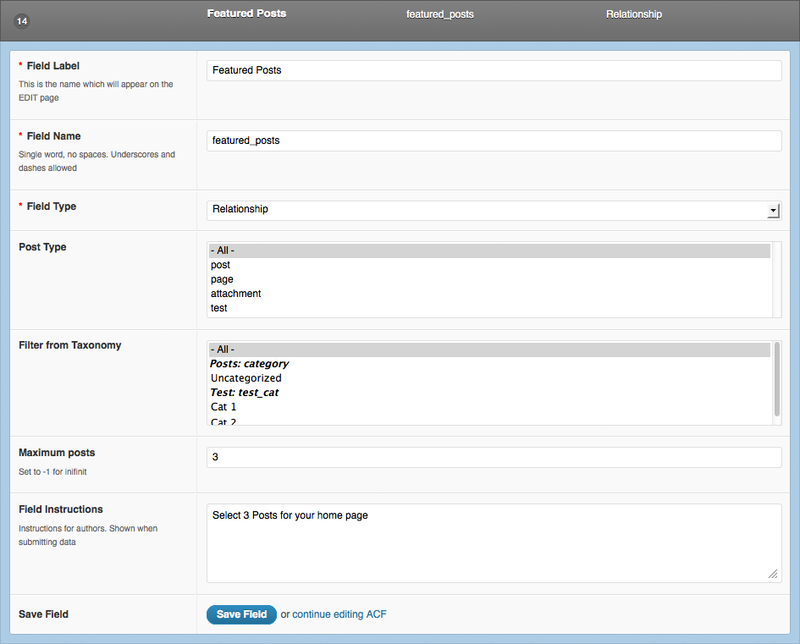 The relationship field contains filters to allow for customization of the posts displayed, and the text displayed for each post.